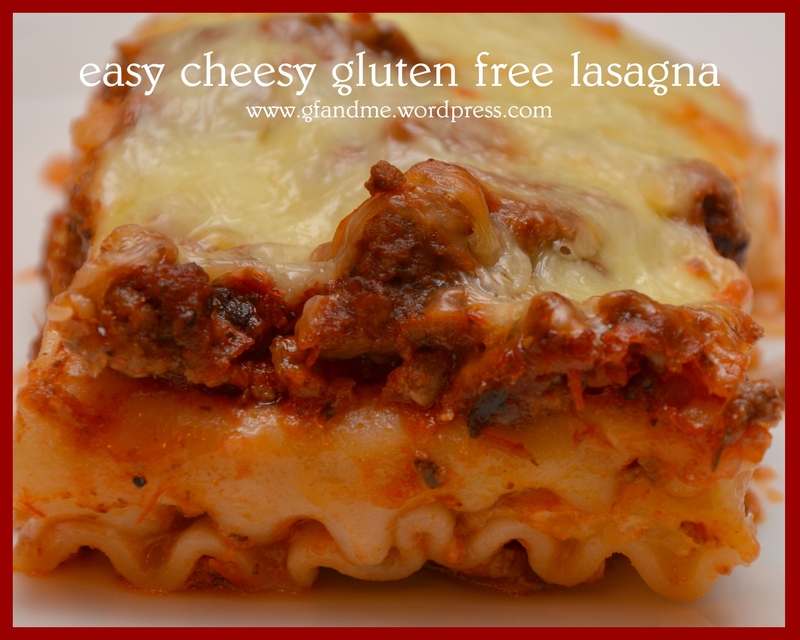 You won’t be able to tell the difference between this easy cheesy gluten free lasagna and a glutenous version! The savory onion and garlic marinara sauce soften up the oven ready gf noodles nicely without making them soggy – but our favorite part is the gooey Parmesan layer in the middle. Awesome! This is a re-post of an early gf and me recipe. We figured we’d circulate it again for our new readers and because it’s one of our favorite go-to recipes – especially on a chilly winter’s day! In large skillet, brown the ground beef with salt and pepper to taste. Add minced garlic, onion, and green pepper and cook until onions are just turning translucent. Add marinara sauce, water, garlic powder, pepper flakes, and onion powder. Simmer for 10 minutes to bring the flavours together. TIP: The water keeps the oven ready noodles from drying out your lasagna. If your marinara sauce has a lot of moisture, the water can be omitted. In medium bowl, mix together cottage cheese, Parmesan, and egg. Layer half of the tomato sauce in the bottom of a lasagna pan. Cover with a layer of noodles. Spread cottage cheese mixture over the noodles, and cover with a second layer of noodles. TIP: You can replace the cottage cheese layer with another layer of meat sauce or with thickly sliced tomatoes and a sprinkle of Parmesan – also very good! Cover second noodle layer with the rest of the tomato sauce. Cover with tinfoil and bake for 20 minutes. Remove foil and bake for another 20 minutes or until the cheese is fully melted and browned. Let sit for 10 minutes to “set.” Cut and serve. Freeze any leftovers in single serving containers. Re-heated in the microwave, it makes a great lunch or quick dinner. This entry was posted in Lunch and Dinner, Recipes and tagged GF, gf comfort foods, gf noodle casserole, gluten free in Red Deer, gluten free pasta, lasagna with cottage cheese, lasagna with meat sauce, tomato noodle casserole. Bookmark the permalink. Like that you used cottage cheese. Nicely done. Thanks. Let us know what you think. I make this a lot for my husband. You honestly cannot tell the difference in the pasta noodles. Yummy! Thanks Cathy. Always nice to hear that people are tryig our recipes! I’m a sucker for lasagne! This looks divine! Thanks! And Happy Australia Day! Lasagne is such a great family meal and perfect for filling up the hungry teenagers in my house.